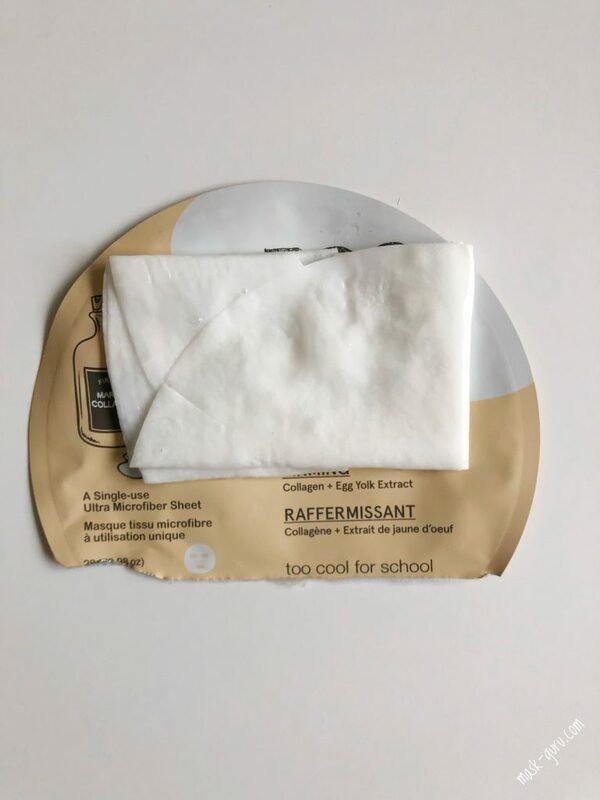 Perfect for skin that’s dull or sagging, Too Cool For School’s Egg Cream Mask Firming is a microfibre sheet mask which is infused with high concentrations of active ingredients to firm, plump and nourish the skin. Specifically designed for dull, sagging skin, this sheet mask is infused with collagen and egg extracts to firm and plump your complexion. Hydrolysed collagen supports elasticity, while egg yolk extract nurtures the skin and imparts much-needed moisture. Fitting comfortably to the skin, the sheet mask adheres to facial contours to deliver the ingredients effectively, granting visible results in as little as 20 minutes. 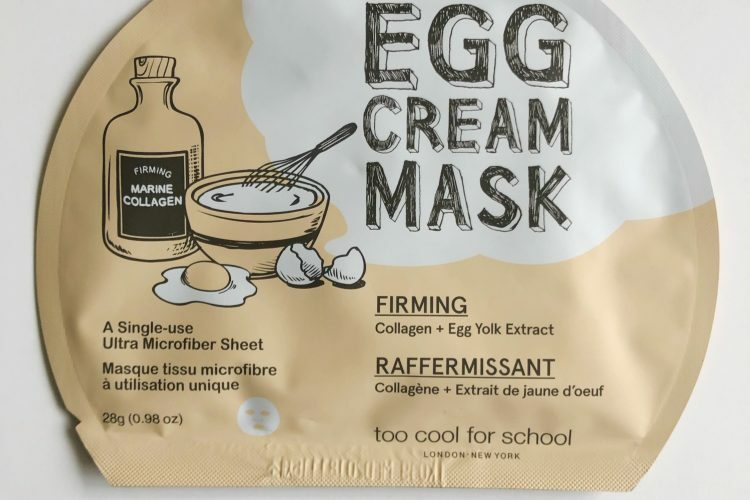 Too Cool For School Firming Egg Cream Mask is an excellent product for my aging skin. It is so rich and nutritious that I would like to use it daily on my skin. Unfortunately the price end of these masks would be a huge dent to my wallet so for now I keep it stashed for the harsher colder days in order to provide the best possible nutrition to my skin. What I love about this mask is that it comes with the plastic gauze backing for the easier application. The gauze openings re large enough not to pull the essence of the sheet and the application process goes really smoothly considering how tacky the essence is. Essence is also highly fragranced. The scent is very potent and floral. To be honest, not entirely something I could fall in love with in terms of fragrance, but it is ok for those 20 minutes when the mask is on my face. Consistency of the essence is resembling some sort of snail mucin serum or a collagen cream. It is stringy and slippery at the same time and opaque white in color. Sheet fit is good size wise but the placement of the mouth cutout is very odd. 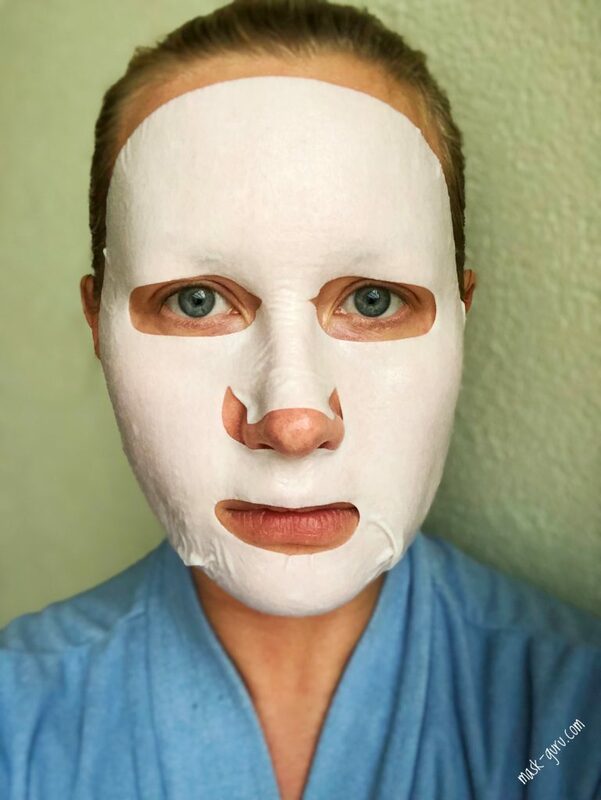 It feels like this mask is made for very long face frame making the area underneath the nose overlap my entire upper lip. It is absolutely not handy for speaking or drinking as the essence gets into the mouth. 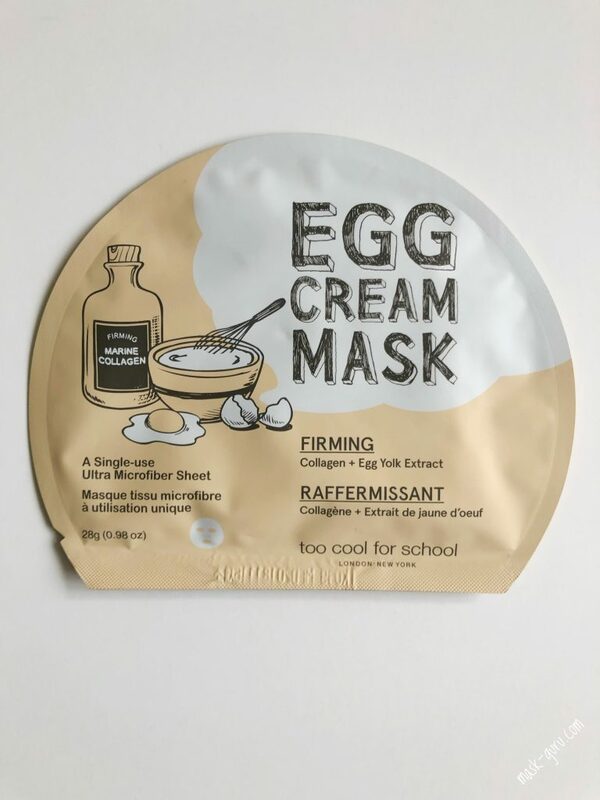 I still love the fact that the sheet of TCFS Firming Egg Cream Mask is extremely soft. It reminds me very much of the sheet fabric which is also used in the HULXEY masks. Despite the odd shape of the sheet, the adherence of the mask is out of this world. Once placed on the skin it doesn’t bulge up until you remove it. The longer it stays on the face the better is the adherence. It feels almost sad to remove it in the end after those 20 minutes I usually keep it on. My skin feels so comfy underneath that sheet. 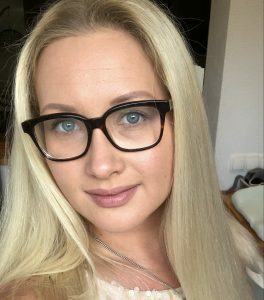 Once the mask is off I am left with a smooth skin which has a sheer layer of a product in it that feels like a rich nourishing skin. I almost don’t want to use any skin care or moisturizer because my skin has achieved it’s comfort zone. I did skip moisturizer couple of times and would not recommend doing that. If you feel that the mask is rich enough simply go for a moisturizing gel with a very light texture. In that way you will preserve all the skin lifting effects without starting to loose moisture in couple of hours. 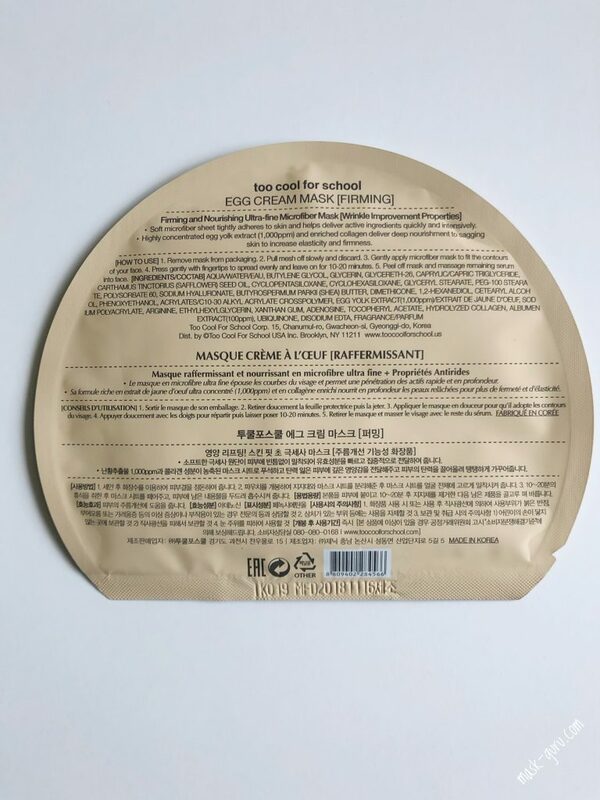 Price is around 6€ per one sheet mask depending on where you get it from. They are usually much cheaper when bought in 5-packs.